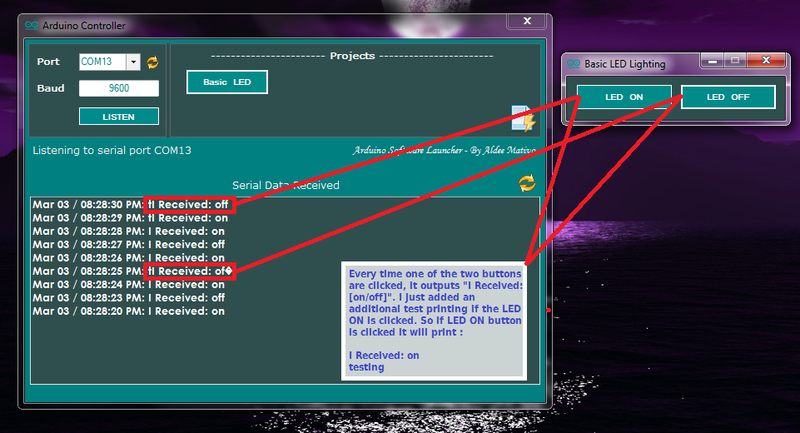 as you can see from the image, when I clicked "LED ON" button, it will suppose to send "on" command to the micro-controller and from there, it will serial print the received string which is "on" back to the application. However, there is a trimming of string happening somewhere out there that I do not know what caused it? I would seriously consider using firmata to simplify communicating with an arduino from vb.net. Go here to get a .net compatible wrapper for it. There is example code in the downloads section on that site as well, so you won't have to start from scratch. 'It validate if they are 3 monitors connected to the system if less or more than 3 the program closes automaticaly. intensity = 0 ' pwr variation variable from 0 to 255 where 0 = off and 255 max power. Not the answer you're looking for? Browse other questions tagged vb.net serial-port arduino or ask your own question. How to determine what is using serial port resources causing access denied? How to write data to a given serial port with qt?